From 22nd - 25th October, a meeting brought together several thousand young adults in Pécs, South Western Hungary. Young people from across Hungary as well as from the neighbouring countries and even further afield came to spend 3 days celebrating being together in prayer and reflection. A baroque town hall, an imposing neo-romanesque Cathedral and the remains of a 4th century christian cemetery; medieval city walls, a 16th century mosque, brand new shopping arcades and narrow winding streets all sit side by side reminding you that this is a modern place with lots of history. Pécs will be European City of Culture in 2010, which meant that during the preparation for the meeting and the meeting itself the city was in a great upheaval with reconstruction work taking place on many of the main squares and streets. Each day a new route had to be found through the trenches and the mountains of sand and stones. This feverish activity was also a metaphor for those preparing the meeting – we also wanted to build a new, more beautiful city, but from within. And it’s also true that when you try to build something then it can become much more chaotic before you have a sense that what you want to build will ever be a reality. The welcome in this small city, nestling at the bottom of the Mecsek hills, can only be described as warm, in every sense! Its "Mediterranean" climate is as famous as the open-hearted friendliness of its residents, as evidenced by the fact that all the young people were welcomed by local people in their homes during the meeting. In fact many more places were offered than were needed in the end. During the common prayers, around three thousand people filled the town’s Sports Hall (the only place in the city where everyone could be together), and on Sunday afternoon the Cathedral was flooded with young and old alike. At the end of each common prayer Brother Alois gave a short meditation, calling attention to the fact that everyone is charged with the same task as the first disciples - to return home, where the risen Christ is already waiting for them. As the meeting came to a close Bishop Mihály Mayer, the diocesan bishop, encouraged the young people and emphasised that the Church trusts in them and loves them. Among the several thousand participants, were a significant number from abroad. Groups came from Croatia, Ukraine, Poland, Romania, Serbia, Slovenia and Bosnia and Herzegovina. There were also guests from Slovakia, Austria, Germany, Portugal, France, Italy, the Netherlands, Spain, Lithuania, Finland, USA, Brazil, Porto Rico, Congo, Egypt and Japan. The memories of the meeting in Pécs organised together with brothers from Taizé in 1989 still live vividly in many of the older people of the city. Europe was still dived in two and they still remember the young people they welcomed into their homes and the atmosphere of hope and optimism that marked that meeting and those times… There was a strong sense that the preparation for the 2009 meeting had begun 20 years previously. But this meeting was not about nostalgia - this time it was their children’s generation organising and taking part in the meeting. Many of them took part encouraged by their parents and teachers, for whom the first meeting had been such an important moment. Of course young people are interested in the same questions now as always : How can I discover my vocation in life? How can we go forward in trust faced with difficulties or failure? How does God speak to us nowadays? The afternoon workshops were very well attended and much appreciated by the participants. Many chose to take part in workshops about discovering God’s call in our lives, the Bible and the works of the Church Fathers. In addition to musical and other programs, others were attracted by workshops about the religious life of the Roma people and living with disabilities. One workshop looked at the biblical underpinning of environmental protection. How we can contribute to the sustainable development of the world, responsible use of energy resources, promoting fair trade ...? The main arrival day of the meeting coincided with the anniversary of the 1956 revolution – a national holiday in Hungary. One of the workshops offered that day reflected on the theme of freedom: that freedom for which so many fought in the 20th century and which now seems only natural to those under the age of 25. The past twenty years have been euphoric; now it is essential to find a new dynamism. Through young people coming together to meet one another, it is hoped that they can contribute to overcoming the prejudices present in our everyday lives. Over this weekend a real communion was visible, bringing together both local people and guests from further away, without worrying about which country they came from, which language they spoke and which church they belonged to. Zoltán from Timişoara (Romania): When I arrived in Pécs, I was immediately welcomed by a busy little group where everybody knew what their tasks were; some were making direction signs, others were checking the list of the expected guests, and still others were answering many phone calls. I was happy to hear familiar tunes even during the first afternoon prayer. That time we sang mostly in Hungarian, but later as the participants arrived we also sang in croatian, romanian, polish and ukranian. The songs of the first common prayer in the sports hall were a real sign of reconciliation. That song was full of hope and zeal, carrying the message that there is a chance of reconciliation even among nations which suffered seemingly unforgivable injuries in the past. Afterwards, the prayer round the cross continued until we had to leave because the sports hall was closing. We left again for home on Sunday, reborn in spirit, full of good memories, hopeful in our hearts that what we experienced in Pécs would help us overcome the difficulties encountered in our daily lives. Maryana from Ukraine: The meeting in Pecs was a very, very nice experience. People were so friendly towards us, the families were super. The parishes, the prayers were so well organized. All of the people from our group were happy that they were able to come to Pécs. For many of them it was their first Taizé meeting and they have some great memories about it. 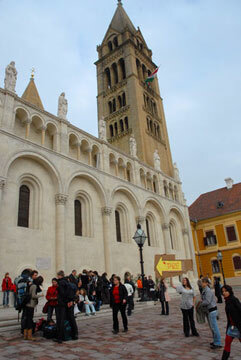 A 18 year old participant writes : I spent a memorable weekend in Pécs during the Taizé meeting. 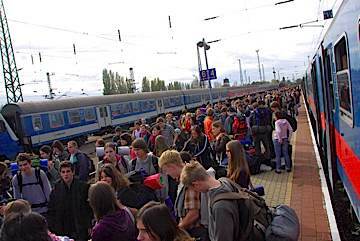 We took the special train from Budapest together with several classmates, doubting a little what the weather would be like, since the weather can influence greatly the atmosphere of a meeting like this. However, we were not disappointed: our host, Vera, told us long stories about her town and her family, and so we experienced the spiritual side of the meeting whilst identifying a little more with the city. It was a great feeling to take part in the common prayers both in the Sport Hall and the parish. I recall with gratitude the attention and kindness of the organisers. Discussing the theme of « friendship » in the small group meeting on Saturday morning meant a lot to me. After having participated in the meetings in Brussels and Pécs, I feel increasingly motivated to return home to be a light to others, proclaiming the good news with a new strength, as we were encouraged to and experienced ourselves during the closing prayer. Annamária from Pécs: The last fews weeks were spent in great anticipation.We continuously advertised the meeting and asking people to offer sleeping places. There was also the evening prayer each week, music rehearsals and all sorts of other preparations for welcoming the young people. We received the list of the countries from which we would receive guests in our parish. As well as Hungarians, we were to receive Croatian and Slovenian young people, so we prepared the signs, announcements in these two languages, we printed programmes, found interpreters, and prepared information materials for the host families. We looked forward with excitement to what was going to happen, how the whole welcome would pass, and in the meantime, we continuously received cakes and biscuits, and together with the tea, soft drinks and coffee we could organise a nice standing banquet. 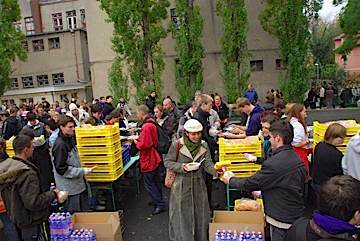 The first few guests arrived at 10 a.m., who, to our great surprise, were Ukranians, and spoke no other languages, afterwards Serb guests arrived, followed by Croatians, but no people came from Slovenia. We were a little scared, since we were not expecting this, but we didn’t fall into despair, we quickly found a Ukranian interpreter, and since nobody had a programme, we downloaded some from the internet and printed them. We sent the Slovenian interpreter to the parish where the Slovenian guests arrived. All in all, we can declare that all the programmes organised during the meeting and in the parishes were a great success, many new friendships were formed, we learnt how to accept young people from other confessions. Brother Alois spoke to us with humility, the beautiful melodies and decorations all helped us in our prayerful recollection, and we learnt how good silence can be, and what a great force lies in it ! The young people returned home, but they left something in our town, in our hearts ! We would like to continue singing songs from Taizé, and many of us will visit Poznań. Marie from France: ... Our host family welcomed us like we were real Queens! There was a real joy in meeting each other, sharing our experiences and our normal lives. This couple have a beautiful faith and the witness of trust that they give faced with the difficulties in their lives is so strong. The father of the family was leading one of the workshops, and he was so happy to have that opportunity ... For me I was very happy to hear many people who were so joyful about the meeting taking place. Many of the "adult" generation remembered the meeting in 1989, and spoke of rediscovering something that had touched them deep in their hearts 20 years ago – which had so rocked them, then daily life had made them forget and which now came back with such an inner joy. These meetings between people, and with God mark us! In the positive sense! Bogi: The meeting greatly enriched me. I really wanted to have a spiritual experience, because my life is a little tough. I had the opportunity to collect my thoughts and to experience God’s love in Pécs. I made me very happy to be surrounded by so many helpful young people. My host family was very kind, they adopted me as a daughter during these couple of days, and did their best to look after me. I am grateful to God for this and I encourage everyone to look for similar opportunities. Gyuri from Pécs: The brothers have finally left for Taizé. So does this mark the end of everything? All of us who participated in the meeting know that that is not so. 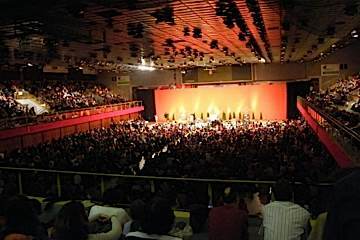 The Taizé meeting does not resemble any other world festivals, nor any other Christian meetings. The aim of the meeting was not to enrich us with nice memories. The meeting meant a lot more to all of us. The joy of directing our gaze towards the Lord together. The joy of putting our trust in others. The meeting is over, but it taught us very important things, most of which cannot be describes with words. The young people left us here their faith and the joy of living together in peace, love and mutual trust. Andreea from Romania: My experience with my host family in Pécs was a source of richness and really made me think about what lies at the foundation of inter-human relations. It showed me again that gestures count much more than words. With the teenagers of the family I got along using bits of English, bits of German. The father, a very nice man, made all kinds of attempts in order to make himself understood. For instance, in the morning he used to greet us using expressions in English freshly taken from the Internet, expressions which engrossed his attention so much that he even forgot to eat. Eventually when he had no means whatsoever of putting across his message, he just started to speak in Hungarian in the hope that we would understand something. We might not have fully fathomed the meaning of his words but by means of the warm looks and the smiles displayed on his, his wife’s and his children’s faces, we understood the essential of what they wanted to convey to us. This experience reminded me of Jesus’ exhortation for the apostles to carry trust and hope in their hearts when going to spread His word throughout the world. Before coming to Pécs I was worried that I would be sent to stay in a family whom I would not be able to understand and God has proved to me that my concern was unfounded since I managed to get along so well with my hosts by virtue of the fact that we spoke the same language of the heart which has its source in God alone who is the same for all nations.